Just when you thought the Dungeness Crab and Seafood Festival couldn’t get any better, the Olympic Peninsula Wineries are throwing something new into the pot. The first annual self guided Tour of Wineries and Poker Run will take place Saturday & Sunday, Oct 11 & 12, starting at 11 am. The best five card poker hand at the end of the weekend wins a gorgeous gift basket and a trio of gift certificates from Seven Cedars Casino. Anyone age 21 and over is welcome to join the fun. Here is how it works. Begin the run at any of the North Olympic Peninsula Wineries, the Crab and Seafood Festival’s Wine Bar located on the Port Angeles City Pier, or the Seven Cedars Casino near Sequim. 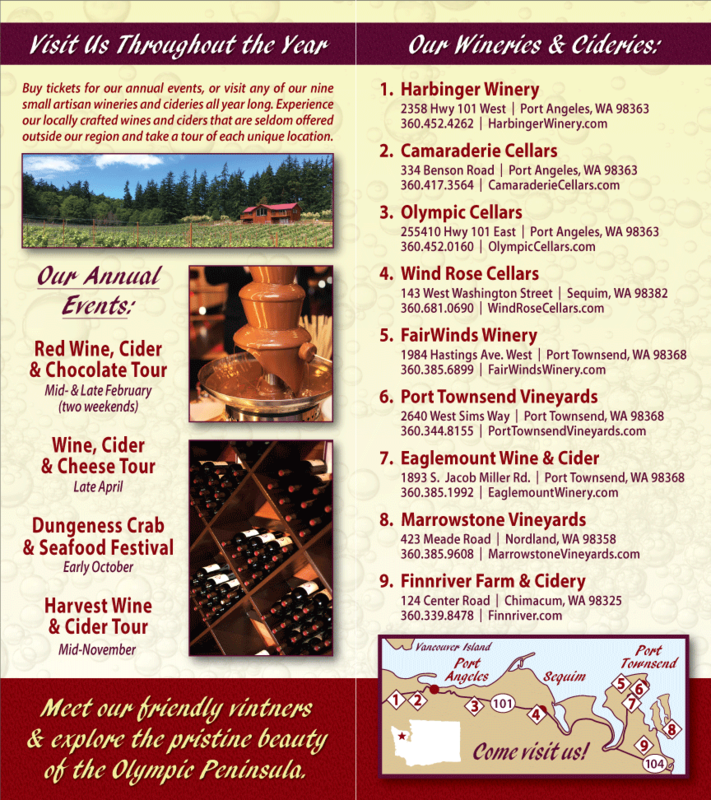 Enjoy some award winning wine and pick up your Poker Run Card, complete with instructions and a map. Each winery you visit, in addition to the Crab Festival and the Casino, offers the opportunity to draw a card and have your personal Poker Run Card stamped with the value of the card you drew. Visit all nine locations and you’ve got nine opportunities to draw for the best potential poker hand, but the number of stops is up to you. A minimum of five stops is required for validation. Each venue will have a depository for completed cards and will accept cards until closing. The wineries will be open from 11am-5pm on Sat & Sun, the Crab Festival from 10am-7:30pm on Sat, and 10am-5:30pm on Sunday. Seven Cedars Casino opens at 10am each day and will offer the last chance to drop off completed Poker Run Cards at 7pm on Sunday. The Poker Run is free of charge. Wine tasting will be available at all seven wineries throughout the day, and customary tasting fees will apply. At the end of the weekend all Poker Run Cards will be gathered and transferred to the casino where the winning hand will be determined. The winner will be notified by mail and email. World Class Wines, Spectacular Seafood, and a winning experience!